The Creative Arts section at Xpress is dedicated to generating and promoting great quality off-air content – our main output being podcasts. But podcasts are certainly not all we focus on, and if simply having a conversation for half an hour isn’t your thing, there’s plenty of opportunity to get your voice heard in other ways (if you do happen to be interested in podcasts, though, you can read Creative Arts coordinator Munro’s post about them here). The Switch is Xpress’s venture into giving pre-recorded content a greater platform and presence on air. It plays out every Tuesday and Thursday at 4pm, and features half an hour of diverse content produced by members and curated by the Creative Arts team. 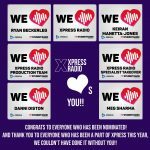 Unlike producing a regular radio show, there is little commitment required with putting together content for the Switch; so if you have a one-off idea or simply just want to get involved with Xpress on your own terms, it’s the perfect opportunity as you have the time to prepare, record and edit as you please. There is also an abundance of options as to what you can do – from radio documentaries or political commentary to comedy, drama or spoken word poetry, it’s your opportunity to be as creative as you want to be. We welcome ideas of all kinds, whether they are fully formed already or need some help getting off the ground. If you like the sound of all this, join the Creative Arts 2018/19 Facebook Page and get in touch with the Creative Arts team, Munro and Alys, and we can help make your ideas a reality.